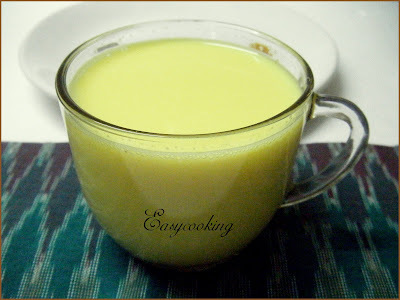 Along with the usual medicines,Haldi doodh/Turmeric milk gets made when we have throat related illnesses.I don’t know how this humble milk became almost medicinal but it does wonders to the sore throat.A warm cup of haldi doodh and a sound sleep,you are fresh the next morning!! Disclaimer – This is not a medicine and cannot be had as a sole cure for cold or throat infection. Mix everything together and boil for 2 minutes on low flame. Close with a lid and keep aside for 5 minutes or so. Healthy and refreshing Milk. Nice post dear. Prefect remedy!i do this milk too..
What a sweetheart! :) I have never had this milk before, should note it down definitely! I agree, Diwali wouldn't be "Diwali" without the crackers! Warm and comforting on cold day. Nice picture and post. Hope he is doing good with ur home made remedies! Always had them when I had cold. I give to my daughter now. We add a little butter just before drinking. my mom gives this to me with a dash of pepper powder whenever i am down with a cough/sore throat. the best thing ever! I always have this when down with cold and cough, the best natural remedy ever! This is a great remedy for cough. I too make it the same way. I add crushed ginger too. Very true. this milk gives a good soothing effect. We too prepare like this. I remember being given this when I was a kid. Must try and persuade m daughter to have some. She's got a sore throat now. 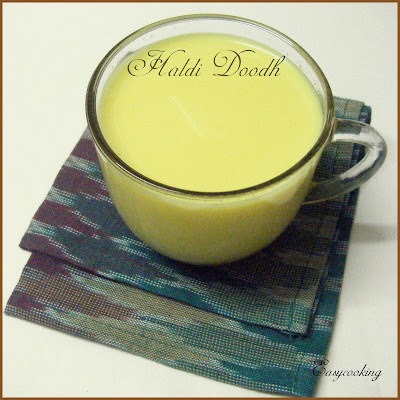 My parents always gave us haldi doodh the minute we had a cold coming. I used to love it. I make it now with vanilla soymilk and it's delicious. Thanks for some lovely memories, Divya!